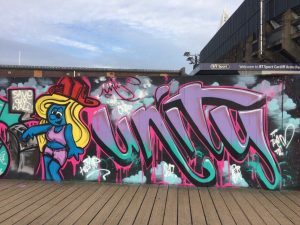 After a long and drawn out process, Cardiff Council has seen sense and will be returning the Millenium Walkway Hall of Fame to Cardiff’s graffiti artists. 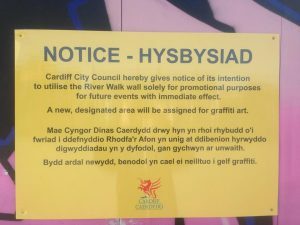 1,178 people signed the petition, but It was thought that advertising along this stretch of wall could bring in £100,000 of well-needed funds for the city and a new location would need to be found. The new location was decided on, at Callaghan Square – not quite so peaceful – surrounded by traffic, but still a safer space than most graffiti spots, and easy for visitors from outside the city to get to. Finally though, it has been agreed that it makes more sense for the original wall to be re-instated. I look forward to seeing many more events to come once the Council’s own branding is removed from the area. 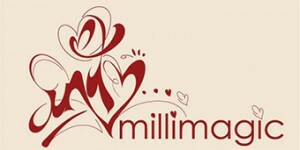 https://millimagic.com/wp-content/uploads/2014/09/millimagic2-300x150.jpg 0 0 amelia unity https://millimagic.com/wp-content/uploads/2014/09/millimagic2-300x150.jpg amelia unity2017-07-28 16:47:342017-07-28 16:47:34Finally! !